Right now I have a lot of feelings running through my body. Not just because i'm pregnant, but the hormones sure don't help in this situation. I should be extactic right now, but I'm not. I am very happy in some ways because overall at the end of the day a W is a W.
I feel like Utah deserved the win a blocked field goal is no easy task. BYU had their chance. The stats are fairly even, obviously... It was a close game! I just have to say though it makes me mad when people don't loose graciously. I am tired of all complaining. Accept the loss and move on. 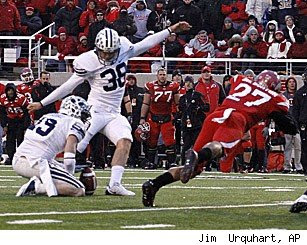 It's not the last time BYU will play Utah. Food, Family and Presents! Saturday November 13th my Mom and sister-in-laws threw me a shower. It was so fun to see everyone and spoil P once again. Thank you everyone who came and for all of the gifts. A big thank you to my Mom and sisters! It was so much fun. We had soup bowls. Broccoli cheese or Taco soup. YUM! Both my Mom and Mother-in-law made Peyton blankets! I don't have a picture of the one Suzanne made, but I will get one with P all wrapped up in in soon! Here are the two my mom made this one matches her nursery and its a "rag" blanket you can't see the detail on it, but it's super cute. This is my green Swedish weave blanket. :) Very beautiful! She has been working on it since we told her we we're expecting. Thanks mom I know you worked so hard on both of these are they are adorable! 33 Weeks Peyton is the size of my favorite fruit! A PINEAPPLE! 4 lbs and 17+ inches! I went to the Dr. and I weighed in at 178lbs again, no change from two weeks ago. I was a little concerned, but the Dr. said not to worry just make sure your taking your prenatals. Her heart is still strong and she is kicking more and harder than ever. Last Sunday night I had I migraine. Not just a regular ole headache. A full on, down for the count, lock my self in a dark room and cry my self to sleep migraine... Mike held me as I threw up all night from the pain. He moved the Dr. Apt forward a few days. I have some strong painkillers now that are okay to take being pregnant. Mike really is Superman, there is no way I could have this baby with out him. 34 Weeks Cantaloupe Peyton is about 4 3/4 lbs and almost 18 inches long. Peyton is about 5 1/4 lbs and 18+ inches long. My friend Amy threw me a work shower. I wanted it sweet and simple and she did just that. We all got together at Pizza Factory :) Yumm! Ate and opened cute presents! Thanks everyone who came and for your amazing presents! Peyton is one spoiled girl. She got lots of clothes and necessities. Her mom got lots of advice that she really needed. :) I love this group of girls they make work so fun. I will miss them a lot, but will always come visit and go to lunch together. This is the group! Besides Amy :( cus she is taking the pic. BREAD TWIST MMMM I can't get enough! Me, Lynne (I work with her and she is my sister in-law) and Kathleen! AMY WEBB and her cute diaper cake she made! I love this, its a tu tu. So cute, thanks Kayla!